Biopics are a tricky business, especially in regards to our national heroes. Like other forms of art that channel our history, it often boils down to a needless battle between the goals of reverence and entertainment. Bonifacio: Ang Unang Pangulo manages to fail at both. Gat. Andres is perceived to be one of the easiest to adapt to the silver screen. The man’s life is practically a tropical Greek tragedy. Driven by the goal of independence, his life easily fits the five elements of plot structure. So why does Ang Unang Pangulo fail? For one, some of the subplots are unnecessary. 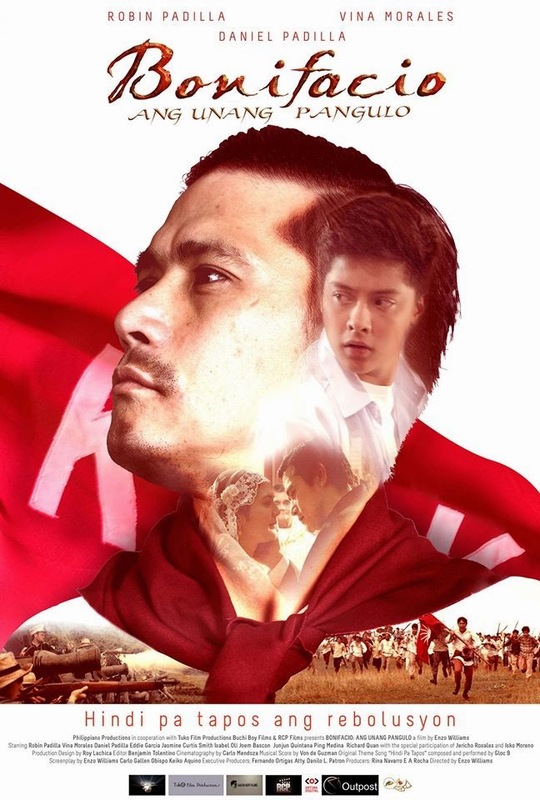 Joaquin (Daniel Padilla) surely does not need to “introduce” Bonifacio to his high school classmates even with the argument for Andres as president. The museum curator (Eddie Garcia) has this notion that history books allegedly portray Andres Bonifacio as a traitor. He says this comes from Bonifacio invalidating the elections during the Tejeros convention. In all my years as a history geek, I have never encountered such a claim. I’ve seen people describe his action as prideful but certainly not treasonous. The dominant story I see in people’s minds is that Andres Bonifacio was the purest Filipino hero of all-time. If anything, it’s usually Aguinaldo (or Rizal to some extent) who is portrayed as a Judas. Another major problem of the film is its lead actor. On paper, Robin Padilla is the ideal Andres Bonifacio. Both are charismatic champions of the masses and embody courage. The former’s award-winning portrayal of an unjustly framed patriotic leader in 10,000 Hours was Bonifacio-esque. Unfortunately, he flounders this time. He overacted and, for some reason, equates Bonifacio’s mannerisms with his own. Basically, it’s Robin Padilla as Robin Padilla cosplaying as Andres Bonifacio. It wasn’t 100% terrible though. Vina Morales was pretty decent as Gregoria de Jesus. She easily outshined her leading man in the film’s most dire scenes. Jericho Rosales is a natural as Jose Rizal. I look forward to any future Rizal films starring him. Director Enzo Williams gave us the best Gomburza execution scene I’ve ever seen. Von de Guzman and Carlo Mendoza deserve their awards for Musical Score and Cinematography respectively. Nonetheless, these highlights do not make up for the film’s many flaws. Maybe someday Robin Padilla will give us a Bonifacio film to be truly proud of. Until then, Richard Somes’ Supremo and Mario O’Hara’s Ang Paglilitis ni Andres Bonifacio shall suffice.